There’s something about being in a hurry that you’ll end up being late. In 2009 we were in Fort William, trying to leave the B&B as we were going to go up Ben Nevis but had to be back in time to have a shower at the train station and catch the sleeper to London. We knew it would be a hard day so we wanted to set off early. Unfortunately the landlady of the B&B was of the extreme chatty side – never shut up talking. The kind of talking that’s just constant talking at you that’s very hard to get a word in edgeways. Even trying to pay our bill took about 20 minutes. We left the B&B about an hour later than we’d planned. I was pondering that day as I left Upper Beeding half an hour later than planned having been having indepth conversations with the landlord of my B&B in Upper Beeding. It would be unfair to compare him to the Fort William landlady because we were actually having a conversation rather than me being spoke at, however he was very friendly, very nice but very chatty! And as such I was a little late. What made me even later was, ten minutes down the River Arun, I found I’d walked off with the room key so had to go back and return it. Sighing, I tried to make myself walk a little faster – Lewes was a long way away – at least 16 miles and probably more. 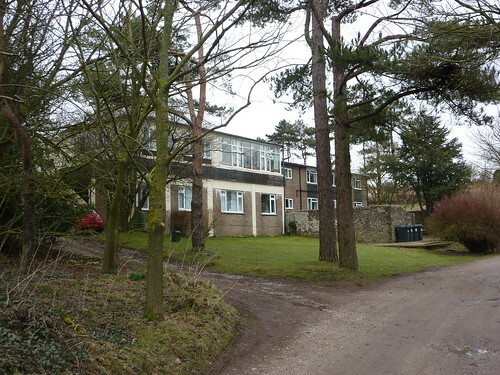 Still, I did have the knowledge that about 60% of the B&B’s business came from walkers and cyclists, and that he’d built the place himself and had decided to make the rooms really big. And believe me, they were really big. And nice too. 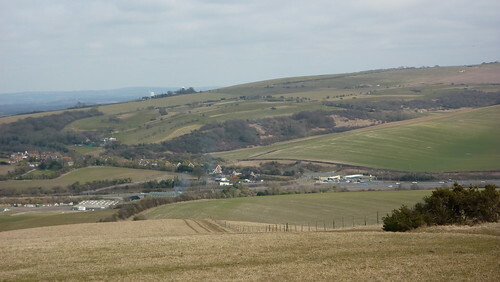 With that in mind, I headed back up on to the hills towards Truleigh Hill and another fine, commanding view of the area. First landmark of the day was assing by Truleigh Hill youth hostel where I’d (ironically) decided not to stay because it would have meant adding two miles onto the previous days walk – if I’d actually worked out I was going to end up walking nearly 20 on my second day, I might have thought differently. The hostel was certainly busy with a stream of cars leaving, and a large group of teenagers with rucksacks standing next to a minibus. Cyclists passed me by and as I headed on I got a glimpse of another outdoor activity in progress as a number of paragliders glided through the sky. 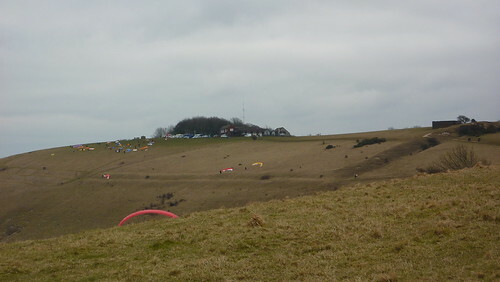 More and more paragliders took to the air, and Edburton Hill was fill of multi-coloured fabric and people taking advantage of the good gliding weather. 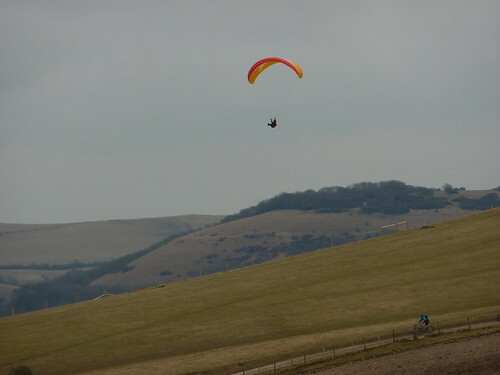 It was heaving, but just round the corner I arrived at local landmark Devil’s Dyke to find few around. I perched on a bench and admired the view whilst getting frustrated that my camera had some blotches on the lens that I just couldn’t get clean. Climbing to the top of West Hill I then got a commanding view of the massive road network around Pyecombe in the valley below, and more importantly, of the Jack and Jill windmills at Clayton, several miles in the distance. The noise of the road seemed to fill the surrounding area, still it was an impressive view. 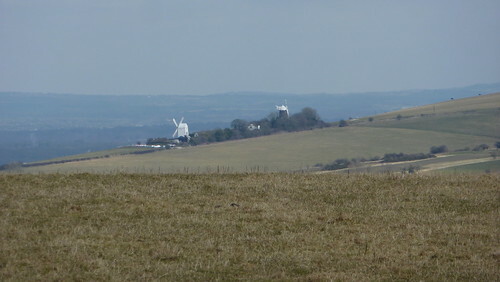 The road seemed less impressive when I got down into Pyecombe, and the South Downs Way seemed to go into a bit of a dull bit as I found myself walking through a golf course however soon the good times were back as I finally approached and passed the windmills. 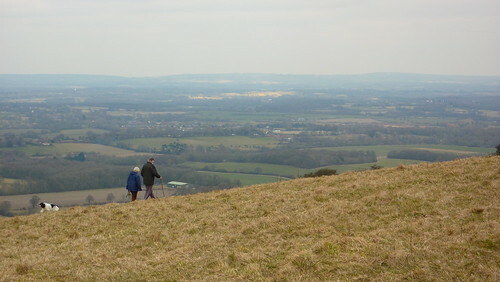 The paths were busy, almost crowded with people taking in the downs as I passed into East Sussex. This was a stretch I knew well, having done it several times as part of a walk from Hassocks to Lewes and it’s a lovely part of the world, basically being a walk on a ridge overlooking the surrounding countryside, with views for miles and miles around. Reaching the turn off to Plumpton where, several years before, Catherine and myself had almost run down the hill to try and get to a pub for lunch, thinking it stopped serving at 2:30 (it actually stopped at 3! ), I suddenly left the crowds and found myself almost alone for pretty much the first time of the day. Far too soon it was time to come down off the ridge, and gently down towards the valley, and after walking through a plethora of grassy fields, I eventually arrived at the A27, but not before walking for a brief but rather sinister looking wood. 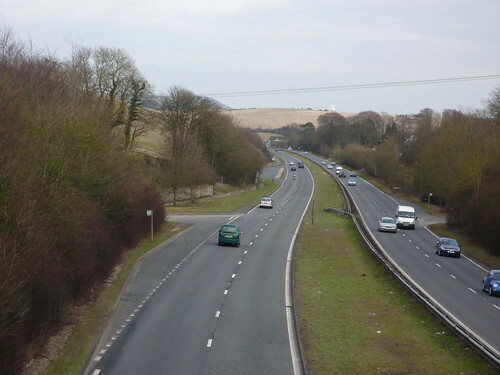 This is the A27 where my guide book reckons is a good place to end. Which might seem odd, but there is a bus stop there with services to Lewes. And I really should have got the bus to Lewes. 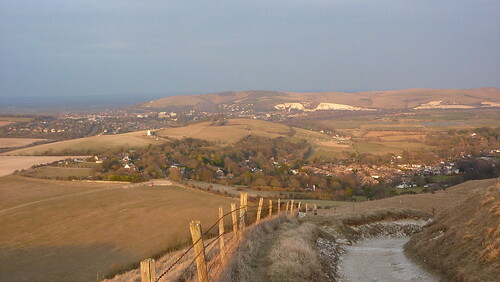 Trouble is, Catherine had proclaimed that a better idea was to walk to Lewes by proceeding further down the South Downs Way and then turning off near a village called Kingston and then walking into Lewes. Even though I knew this would add several miles to my journey, and even though I knew I’d done at least 16 miles already and it was nearly half four, I had one of those nagging feelings I should keep going. I have no idea why. But I did. 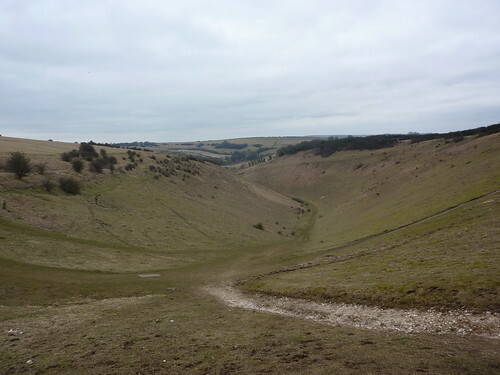 I regretted it as I ended up climbing up hill again, going in a big U shape around the mighty Cold Combes. 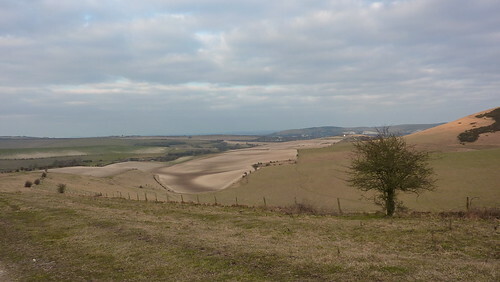 A large valley area, with sheep grazing at one end, much of the rolling landscape had been ploughed ready for planting. 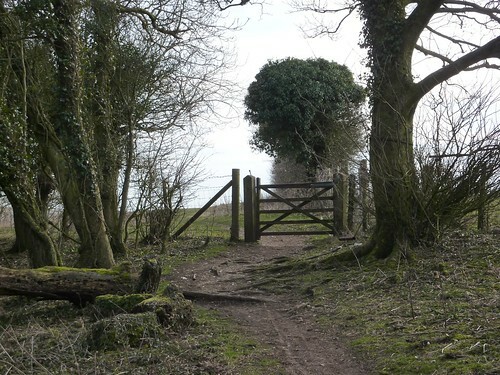 It wasn’t exactly a steep climb – far from it – but I just seemed to struggle doing it. Still the views were pretty impressive and as the sun started to lower itself, a golden glow was given to the views of the area. 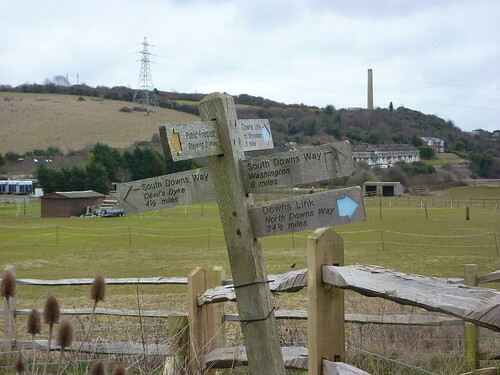 I walked a short way along the Jugg’s Road – so named because it’s an ancient route used to carry fish to Lewes market, stored in pottery jugs – and found the turn off for Kingston, wearily waving goodbye to the South Downs Way for now. 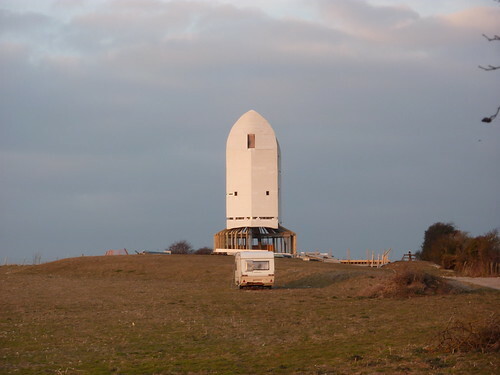 Where Lewes was I wasn’t quite sure, however after leaving Kingston, I did manage to see a rocket sitting in a field! Excitedly wondering what it was – and thinking it was probably a windmill under construction – it wasn’t until I got home and found the answer – which was that it was a windmill under construction. A replica of one destroyed by wind in 1916 none-the-less. And it looked especially good as the sunsets started and the sky was filled with red and orange. 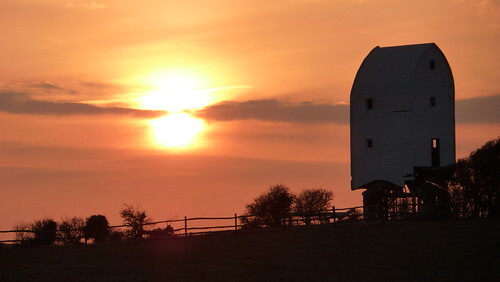 Leaving the embryonic windmill behind and crossing back over the A27 again, I finally found myself in the outskirts of Lewes with little to do but find the station and head home. Having no map of the town, this was easier said than done, however I made it in the end. Just after six, and after eight hours spent walking 20 odd miles I had little more to do than catch the train. I hobbled into the station, collapsed on the train and bought a bottle of Harvey’s Blue Label from the train’s refreshment trolley. The hardest day on the South Downs Way was done. The sun had gone in. As we hurtled through the dark countryside, I supped by beer and thought of home. First Published: 30 March 2010. Last Updated: 16 November 2014.